NOTE: There are two installation options shown. 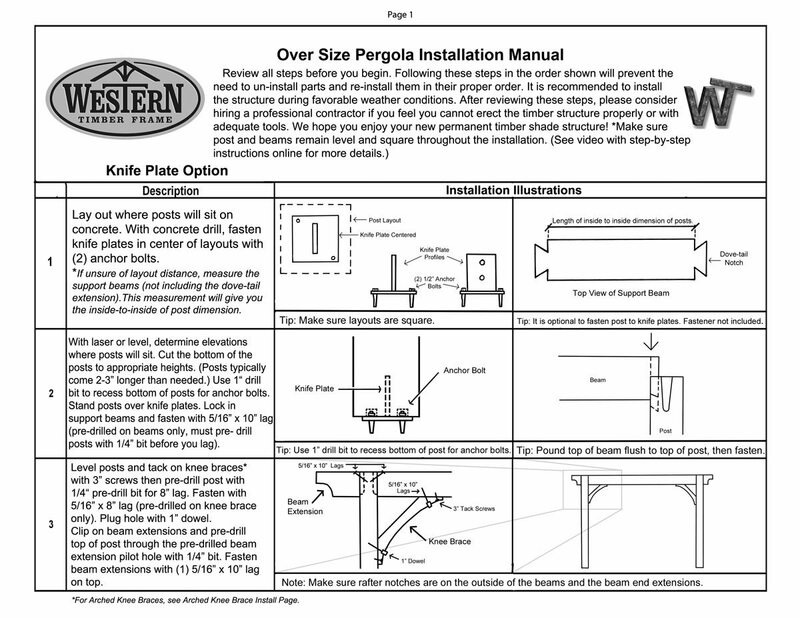 In most installation scenarios you will only use of of the two options: Knife, or Footing installation. Q: Some of the timbers on my new pergola kit are beginning to crack. Is this normal? A: Yes, it is referred to as “checking”. The reason there is an actual technical term for it is because it is a completely normal and naturally occurring process. The term “cracking” would imply that there is a defect in the wood itself. Wood will always expand and contact when outdoors. 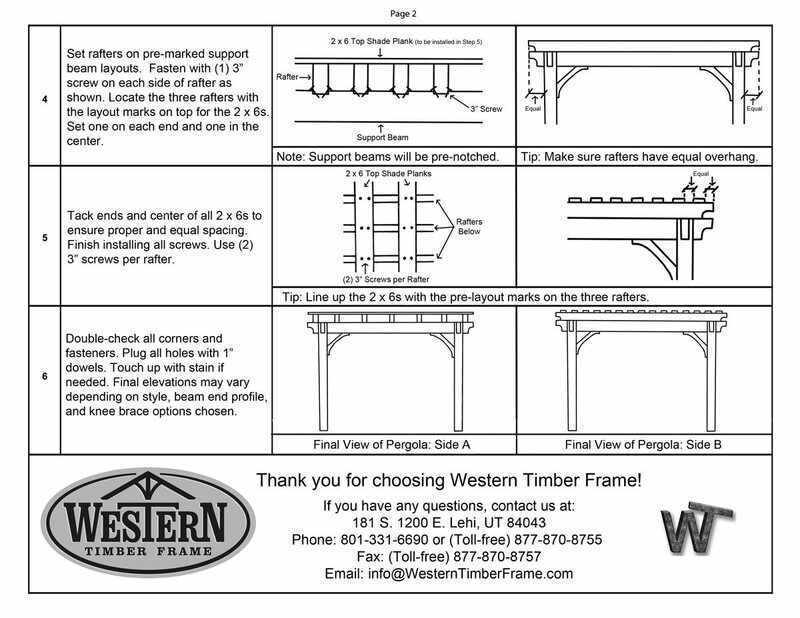 However, our timber pergola kits will not loose their structural integrity once checking occurs. The checking is often more obvious when you have a darker stain but once you apply the next coat of stain or use some of the touch up stain provided you will not notice it near as much or at all. Q: Do I need to put 4 concrete bolts in each knife plate? A: No, you only need to fasten the knife plate with two bolts per knife plate. We have provided 4 holes per knife plate for your convenience to choose which holes to fill. Some times your knife plate may need to be installed on the very edge or corner of a concrete patio. We would suggest not to use the hole that is closest to the corner. We would also suggest to use two holes that are diagonal from each other rather than on the same side. Q: My plugs (or dowels) seem to be too tight. Should I pound them in with a hammer? A: When installing an “Over-size” timber kit your plugs should pound right in with a rubber mallet. 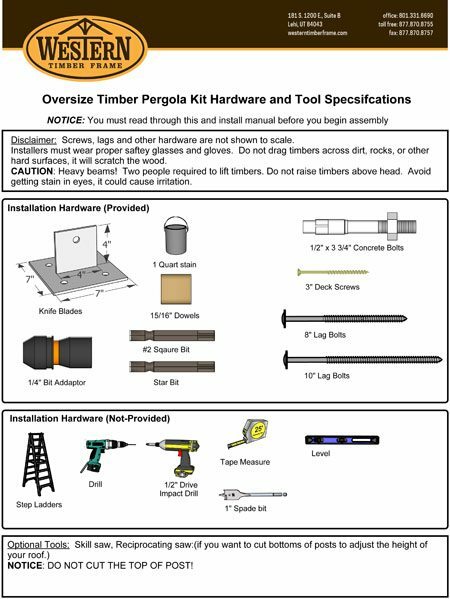 If installing a “Full-size” timber kit we have tried to make the pre-drilled holes a little bigger so that you don’t split the knee braces when pounding in the dowels. You may need to apply a small amount of glue to hold them in if they are loose. 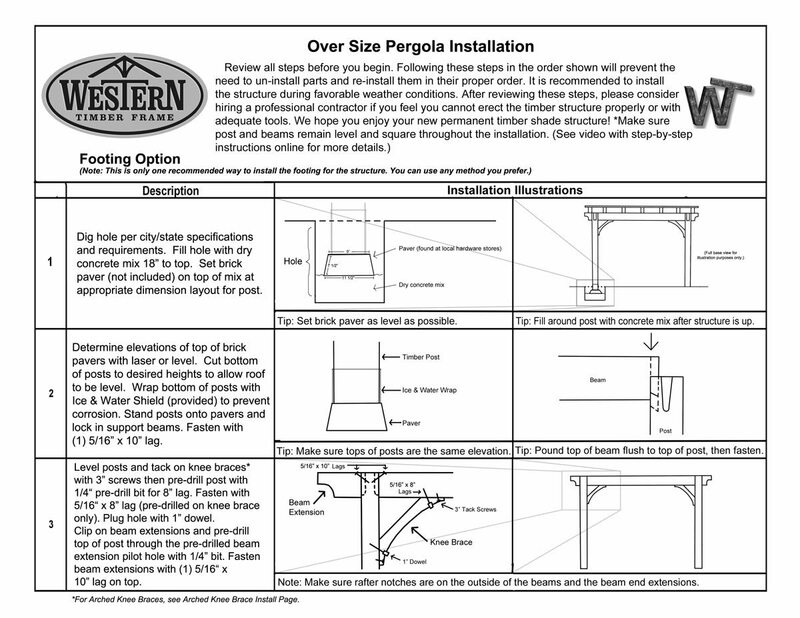 Q: How long does it typically take to do the touch up stain after my pergola kit is installed? A: It can take up to 1-2 hours to do the touch up staining. To minimize the touch up we suggest to lay out all your timber pergola kit pieces on grass or propped up off the ground on 2×4’s or saw horses so that they do not get scuffed up by the rocks and dirt. Q: Am I supposed to have so many screws left over? A: Sometimes we send too many screws because we weigh them instead of counting each screw individually. Because of this we have in the past been a few short. We always try to over weigh each kit so that you have too many instead of too little. If you happen to have too little please send us the bill after you purchase enough screws to finish your project and we are happy to send you a reimbursement check to cover the cost and some extra for the inconvenience. Q: My 2×4 or 2×6 top shade planks are a little higher than some of the rafters. How do I screw them down? A: Because our timber rafters vary sometimes in thickness you may have a couple that are 1/16” to 1/8” shorter or taller than the rest. Please note that this is normal for timber and well within specs. This may apply also to 1 or 2 rafters that may be slightly wider than the pre-notched layout on the lower support beams. If this is the case please use a chisel to widen the layout mark as needed. Q: My 2×4 or 2×6 top shade planks are not 100% straight as an arrow. How do I fix this? A: This is the age old question that has been asked since the beginning of time…how to keep wood from moving? Because each 2×4 or 2×6 top shade plank is fastened with two decking screws per rafter you will be able to tack the planks from one end to the other and this should straighten them out. The longer you let your kit sit before you install it the more your wood will begin to move. Our kits, like all timber structures, are designed to be fastened together as soon as possible. Q: How often do I need to stain my timber pergola? A: Some like to leave their pergola for many years giving it an aged faded look. Others like it to look pristine and new. We recommend, that if you want your pergola to look new longer, to re-stain it once within the first 9-12 months after installation then every 3-5 years after that as needed. (Keep in mind that this will depend how much sun your pergola is exposed to on a daily basis.) Our timber kits are not like decks which need to be re-stained every year. Q: Sap is dripping from the timbers on my pergola. Is this normal? A: Yes, once your pergola is installed it may drop some sap for the first few weeks. Sometimes the timbers are just adjusting to the climate and altitude of your backyard. Q: What is the best way to remove sap from my deck or patio? A: We have had success removing sap with turpentine, lacquer thinner, or Goo Gone.